Public transit operator Transdev has started operating Milwaukee's first streetcar, in the USA. On October 2017, Transdev has been awarded by the City of Milwaukee Department of Public Works with an operating contract for the Milwaukee Streetcar, WI. The streetcar service, The Hop, officially began for a five year period and the contract also provides for an additional five-year period. Milwaukee's first streetcar is in service. And it is free of charge! The commissioning of Milwaukee's first streetcar, The Hop, took place on November 2. This kick-off followed the official inauguration during a weekend of celebrations throughout the city. Thousands of residents attended the inaugural ceremony, alongside the city's mayor, Tom Barrett, and many municipal leaders. 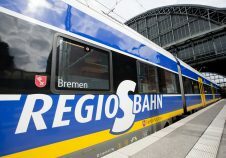 This new line is expected to generate significant economic development along the route, but also connect neighborhoods and communities and strengthen business clusters. It adds a new mobility option that also serves for economic investment and neighborhood revitalization. Milwaukee streetcar operates in shared traffic on city streets with stops every three to four blocks. The tramway line, which extends 2.5 miles through downtown, is served by a total of five vehicles. The Hop service is free during this first year of operation for every passengers. We are very proud to serve Milwaukee, a forward-thinking city now incorporating streetcars as part of its vision for improved mobility and for the continued development and revitalization of its center city. Under a five-year contract awarded by the Milwaukee Department of Public Works, Transdev will now oversee all aspects of the operation of Milwaukee’s streetcar services. 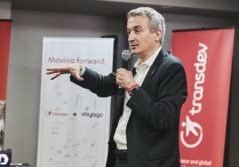 Transdev will be in charge of the overall performance of the system, including personnel management and driver training, as well as customer service and security. 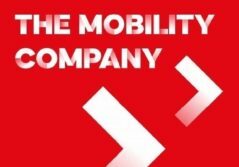 Vehicle maintenance and servicing will be managed by Brookville, the tram manufacturer, under the supervision of Transdev. 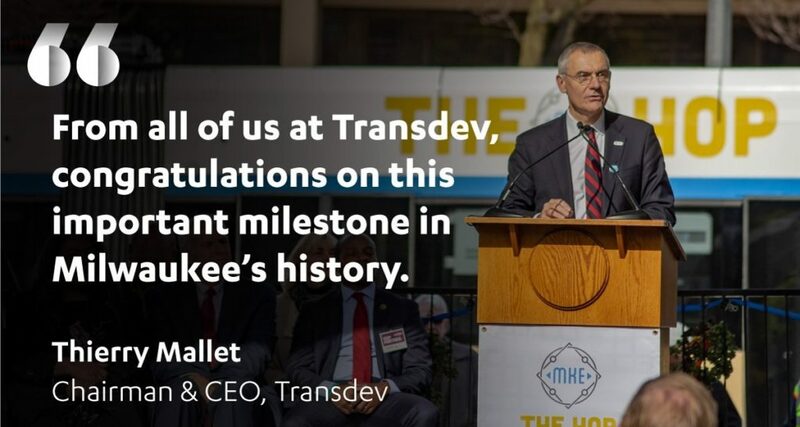 The Milwaukee Streetcar adds to Transdev’s growing portfolio of streetcar operations and maintenance in the USA (New Orleans, Cincinnati, Detroit and now Milwaukee). We have a strong team in Milwaukee and are committed to providing first-rate service. I look forward to the enhancements and improved efficiency we will implement over time to benefit passengers and our client. We are committed to continuing to build a strong partnership with the Milwaukee Department of Public Works and to helping them achieve their goals.